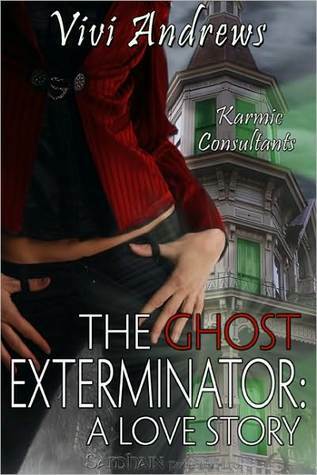 I picked up The Ghost Shrink, The Accidental Gigolo & The Poltergeist Accountant after reading the second story in the Karmic Consultants series, The Ghost Exterminator. 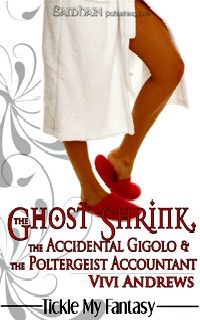 I enjoyed that full length novel so much that I had to start from the beginning with the novella that started it all, and while I admit I enjoyed The Ghost Exterminator quite a bit more, The Ghost Shrink, The Accidental Gigolo & The Poltergeist Accountant was cute and fun. Lucy Cartwright is a medium, but she's been sexually frustrated for so long that her energy is connecting the most prurient ghosts to her for help transcending, and frankly, she's getting a little fed up with short, balding, overweight accountant-type ghosts stripping down in her bedroom and bumping and grinding their way towards her bed. A call to her boss for help with the embarrassing situation ends with a suggestion that Lucy rid herself of her frustration to rid herself of the horny ghosts. To put it bluntly...and a bit crassly...she needs to get laid. Considering that the helpful, if difficult to take care of at the drop of a hat, suggestion came from her boss, it wasn't Lucy's fault that she assumed the tall, dark, and delicious-looking male who banged her...er...banged on her door the next morning was an...employee bonus from the boss. He introduced himself as Cox, after all. Imagine her mortification, then, when she realizes that Jake Cox not only isn't a gigolo that her boss set up to help her out, he's a private investigator and the brother of said boss. Really, would becoming one of those horny ghosts be so bad after she dies from embarrassment? Jake needs Lucy's special brand of help and Lucy needs special help, full stop. And they both want each other badly. Toss in a couple of horny, pathetic ghosts and a murder investigation and you have the fun, silly romp that is The Ghost Shrink, The Accidental Gigolo & The Poltergeist Accountant. It's a light read, and it's told with Andrews' quick-witted and carefree style that goes down so easily. As a novella, it lacks in the depth of plot and character definition areas, though enough is provided for some fun. My only real problems with it were that it was a bit too light for me, almost slapstick, and Lucy and Jake's seismic-level attraction was a bit shallow for my tastes. There just wasn't enough time in the story, which even for a novella leans more towards the shorter end, to develop a relationship between them that was based on anything but physical attraction, so that didn't quite work for me. Still, this is a novella that isn't supposed to be taken too seriously, just enjoyed for what it is. It may not have been totally to my taste, but The Ghost Exterminator definitely was, and I've already downloaded The Sexorcist, which is the third book in the series and the second full-length novel. I will say, while I enjoyed seeing Lucy and Jake's introduction, as I'd met them in The Ghost Exterminator, ultimately either of those stories could be read as stand-alones.